The United States Chess Federation - Shabalov on a Perfect 5-0. Home Page Chess Life Online 2007 May Shabalov on a Perfect 5-0. Shabalov on a Perfect 5-0. Alexander Shabalov leads the Frank Berry U.S. Championship one and a half points ahead of the field, with a perfect 5-0 score. 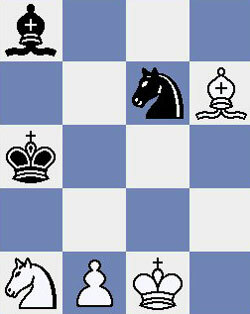 In round five against Gregory Kaidanov, Alex showed off his endgame technique in the lead diagram. Alex played Bc6+ after which Ka5 b4 Kb6 bc5+ forced Kaidanov to resign, in view of the winning pawn endgame after Kxc6 Nb4+ Kb7 Nxa6 Kxa6 Kd3. (See full game score below.) Meanwhile, Hikaru Nakamura bounced back from his loss against Shabalov with a win against Yermolinsky. Local star Michael Langer defeated David Pruess, his second IM in a row (He won against Justin Sarkar in round 4). Web editor Jennifer Shahade just arrived in Stillwater, so look forward to live photos and reportage from the final rounds! More than halfway through the tourney, Gilberto Luna II has a 1.5 point lead on the rest of the field. Considering how tightly packed the scores are, this is a fairly incredible lead. Can anyone catch him? Well based on how the leaderboard has changed from day to day, it's certainly clear that few leads are unsurmontable in this contest. GM Shabalov though with his impressive 5-0 score has once again not allowed any team not bearing his signature to crack the leaderboard, and it certainly looks like his main goal may be to ensure that the winner of this competition is flying his flag (with the minor side goal of becoming US Champion I'd think). This is where we stand as of now (the longest game still being the GM Gulko - IM Bonin 98 move struggle of Round 2).